Are you looking for a way to get your students excited about your upcoming unit on the American Civil War? Maybe trying to find some way to make your classroom more dynamic, interactive and engaging? The great American Civil War start that your looking to hook your students with could be Mr. Harms’ American Civil War Simulation! One of the best American Civil War Games on the education market today. Students are assigned the roles of leaders of individual states in 1860. Each state then votes in the national election for the candidate that most closely fits the beliefs of the majority of people in their state at that time. One by one, each state casts it’s vote for the 4 candidates that ran in 1860: Stephen Douglas, John C. Breckinridge, John Bell and Abraham Lincoln. The objectives of the states clearly fall along the lines of States Rights and the supporters of the Union. One by one, the Southern States begin to secede from the Union and form their own government: The Confederate States of America. The Northern States meet and determine how they are going to deal with these rebels. Border states are torn by which side they should support. Conflict is now the order of the day! Both sides meet to determine their course of action and discuss their strategy. During the course of the simulation, students experience the obstacles, advantages and disadvantages each side has as they navigate through multiple difficult situations. With the vast majority of industries/factories located in the North, the Union has the capacity to manufacture the war materials they need. The South, which is primarily agricultural, is relying on the Factories of Europe to produce it’s war materials. Eventually the North will Blockade Southern Ports with it’s vast navy. The South will get a trickle of supplies from the blockade runners, but will be no match for Northern industrial production. Another effect of the blockade is that Southern Cotton can’t get to markets in Europe. Logistics is an important component of conducting war. The Railroad network in the North is vast and the railroad network in the South is sparse to say the least. The ability to move men and materials rapidly is a decisive advantage the North had with its’ vast railroad network. Natural Resources are another important factor in the production of war materials. The North has the lion’s share again and the South is dependant on outside sources. These simulations originally started as Word and Excel documents which could keep teachers frantically busy keeping up with student’s movement and declarations of war. Now, with the online simulation platform, the teacher can easily move armies and conduct battles with a click of the mouse. Students also have access to online maps that update every time they refresh their browser. Create a dynamic environment in your classroom and at the same time get your students interested in learning more about the American Civil War. Enhancing strategic thinking skills: Simulations engage students to take a broad, long range approach to problem solving and decision making. Strategic thinkers are the most effective leaders. Strategic thinkers understand how their actions affect others and predict what reactions to expect. Students learn the advantages of strategic thinking and begin to apply those lessons to the real world. Problem Solving: Simulations are centered around a problem (completing their objectives) and students are challenged to solve those problems. Each simulation generates hundreds of problems and situations that must be solved by the students. Stimulating students imagination and creativity: Simulations inherently have a certain amount of “free will” designed into them. Although the teacher needs to keep the simulation within the historical context they are teaching, students have the flexibility to create their own theories and solutions. Student Exploration: Leaders, in the simulation, must make decisions without knowing how the other leaders might react. This causes the student to anticipate what their opponents reaction might be and that requires some higher order thinking. Teaching Consequence: Simulations often operate on an action-reaction principle. Students, as leaders, make decisions and other leaders react to those decisions. Just like in the real world, decisions are made and there are always consequences to those decisions. Students learn that consequences not only affect themselves, but affect their allies (friends) and others. Political and Physical Geography: During the course of the simulation, students build a template in their minds of the political and natural structure of the world and the countries involved. Students also gain a logistical understanding of the regions: seas, oceans and trade routes. After the Simulation is over and you begin discussing what really happened, students are a lot more interested and engaged. Understanding each country’s situation, history and circumstances: Students learn not only about the country they are assigned, but also the other countries involved in the simulation. Students are then able to understand each country’s self interest, advantages and disadvantages. The Alliance System: Students learn the advantages and disadvantages of an alliance and also develop an awareness of the danger alliances can create. These lessons can be applied to their own personal situations in life and may help them understand how their actions affect others. Students understand how the history of each nation and or region, influences the decision making process in each country. Students will understand how specific events affect countries, which in turn determines or changes that countries policies and actions. Students will understand how technology, or lack of technology, has a dramatic affect on society and the battlefield. Students will understand how natural resources are the life-blood of an industrial economy and how nations will do almost anything to control them. Interaction of leaders and engaging of diplomacy by students: Students will be engaged in diplomacy with other countries as they seek to solve problems and avert crisis. Students will learn to assess other country’s self interest in order to make deals and ensure their own countries security. In conclusion, you can see that students are immersed in a wide range of critical thinking activities that will increase long term learning. This is an experience students will remember decades after it’s over. 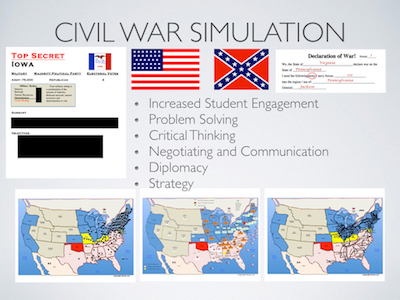 Using gaming in social studies classes is a fairly new concept to most teachers. In actuality, simulations have been used for quite a few years, but maybe not to the level of HistorySimulation.com’s WW1 simulation games. In Mr. Harms’ version of the epic WW1 conflict, students are assigned countries and given tasks or objectives to accomplish during the activity. These objectives mirror the objectives countries had during the Great War. With the outcome of this conflict not guaranteed, students become very competitive to try and achieve their objectives. With sixteen countries and as many as 30 or more students involved, in some cases, it’s not hard to see how this could develop into a very intense and engaging lesson! 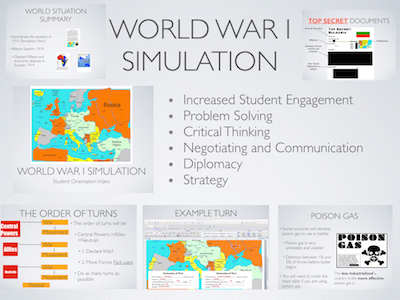 With HistorySimulation.com’s new online platforms, the teacher is easily up to the task of controlling the simulations from their computer. If the students are in a one on one technology situation, they have access to the maps online and can even update them automatically by simply refreshing their browsers. The engagement in the classroom soars through the roof as students compete with each other. Some teachers kind of fear this type of lesson, because they think students will just sit there and do nothing. As soon as the first set of students leaves the room to negotiate, the wheels start spinning and everyone starts talking to their allies. Soon the entire room is engaged in talks with each other and strategies start to develop as they prepare their armies for battle. If you’re wondering how a battle is conducted, I’ll describe it for you. Let’s say that Germany and Austria-Hungary have made the decision to attack Serbia. Both countries will sign declaration of war slips that indicate how many troops each is sending into the battle as well as the region, in this case Serbia, that they are attacking. Both leaders, or their representatives, now bring the slips to the head table (Teacher) and turn them in. The battle is announced to the class and Serbia, in this case, has the chance to pull in alliances to help defend them. The only troops that can make it to the battle have to be within one zone of movement or they cannot participate. Once this has been decided, the teacher drags the armies into Serbia and double clicks on the Serbian region. The battle is automatically calculated, a small ball of fire explodes on the map and the defeated armies disappear and the remaining forces of the victors remain. The same process is used until all the alliances armies have been used once, or as much combat as they wish to do. The one constant rule is that you can only use your army once per turn. When everyone in the alliance has finished combat, then they can move any forces that were not used during this turn to get into strategic positions for the Allies turn, which is next. We have been hearing a war coming soon and it is now time to prepare. We are part of what is called the Allied Forces and we are to defend ourselves from the Central Powers. Our plan to do so is to get as many of the neutral countries as possible in order to isolate the Ottoman Empire. If we were to get Bulgaria, Romania, and Greece, then we would have just cut off the Ottoman Empire from the rest of the Central Forces. By doing so, it will be a easier to take over the Ottoman Empire. A lot has happened so far this year and we expect more to come. Archduke from Austria-Hungary was killed and this is going to start a war between Serbia and Austria-Hungary. One major thing that has happened is that Russia and Serbia attacked Bulgaria hoping to take over that territory. We honestly think that Russia is doing everything they can to take that peninsula that Bulgaria and the Ottoman Empire have. As for strategy, we know that our navy is very strong and we feel if we can take out everyone else’s navy, our land will be safe. Our navy is very strong and large, so by taking out everyone else’s navy, it will make it harder for another country to raid us. There has been a lot more war going on and Germany has taken over part of Russia. We weren’t able to help and defend Russia and we felt pretty bad. Russia is one of our closest allies and we weren’t able to help support them throughout. Russia is one ally that we don’t want to make mad because they are very powerful. Germany is really starting to stir the pot because they sunk the Lusitania. This ship had many citizens of ours. We know that our troops and our navy are stronger than Russia’s, but they have more numbers. Yeah, we can take out their navy, so then we’re safe, but they can help us get what we need to get done. One major thing we know is that Russia helped us weaken the strait. We sent quite a few troops to the Ottoman Empire to take over the strait but failed. The one good thing that came from that though is that we were able to weaken the Ottoman Empire greatly. The Ottoman Empire now only has roughly 300 troops. After the next turn, we might be able to take the Ottoman Empire. If we can take this, it will help strengthen Russia back up. Every year that we don’t have the strait, we aren’t able to get supplies to Russia. Over time, this will make Russia very weak, and we can’t let that happen. This year has been a rough year for the allies but we hope to bounce back. We lost a lot of territory this year as the German troops are so much stronger than us. We did gain the United States and their troops are great at helping. The only problem is the Germans army is so much bigger. They took over Belgium even though we had over 1000 troops to try to keep neutrality. France also had over 1500 troops in their to try to help. When the Germans went to try and take it, we, Great Britain, sent another 500 or so troops to try to keep Belgium but it didn’t work. This was the biggest battle of the game. Roughly 10,000 troops were fighting in this battle. Once Germany had Belgium, they sent many troops to F1 of France and took their capital. After this it was a stand still for quite some time until we were able to think of a plan. Our plan for next year is to try and take that back. France is a huge ally of ours and if we can’t have them, then they can’t either. Another thing we need to do is attack the Ottoman Empire again because we need the Dardanelles Strait. Many people thought we were really dumb by doing what we did this year. We combined all of our navy and sent a lot of troops down to French North Africa. Another thing that happened is that Greece took back Serbia. Right after they did this though, Austria-Hungary decided they wanted to take back Serbia, so they did. While doing this, we allowed the United States and France to send some of my troops to France to take back their capital. Right after we did this, Austria-Hungary tried to take the capital of Italy, but resent all of my troops there to protect the capital. We then realized that our plan was going to work and we sent all of our remaining troops to the Ottoman Empire and took the Dardanelles Strait. This was one of our big objectives that we were able to accomplish. By accomplishing this, we strengthened Russia back to where they needed to be. We knew right away by sending as many troops as we did, we could take the strait. We sent over double the troops the Ottoman Empire would have been able to supply. Granted they took quite a few, we still remained victorious. In all, this year was great for the Allied Powers. The world is about to break out into a huge world war! The Archduke was murdered and the whole world has their opinion about it. Knowing it was the wrong thing to do, I am in alliance with Austria-Hungary and Germany. We have our troops mobilized and are ready to go. Our strategy is mainly to be loyal to our alliance and keep the lines for communication open. We want to help them in any way so that they will help us. Today Bulgaria was attacked by Russia and Serbia. I couldn’t let the Allied Powers gain that country because then there would be no way for me to get to the rest of my alliances. My only choice was to help them defend their territory, so that’s what I did. We sent troops to help them and we won! This was a loss we didn’t want to have to deal with so early in the war, but we made it work. Also by doing this, Bulgaria allied with us and because of that, I had a window in to the rest of the war. After that attack there was kind of a stand-still with the war, everyone focused their energies on strategizing and making a plan for the next year. We were planning on sending Russia to attack Germany the next year. This was the year, Germany attacked Russia… and took part of it! We thought of this as a great success, but we knew that now our empire would be under attack. We were preparing for a war in our O2, so we moved more troops over there. This also caused the Allied Powers to get a little on edge, so they moved a lot of their troops around in order to have a better chance on attacking in 1916. As and allied group, we decided to do more movement and not focus on war. We want to be prepared for whatever the Allies are going to throw our way We got attacked by Russia in our O2, even though they had more troops, ours were stronger and we were victorious! However, right after the war was over, we got attacked in our O1 by Great Britain, Italy, and France. This battle was a bigger deal for us, but we still managed to pull through! I was so proud of our troops and how well they fought and worked together. We didn’t completely do it on our own though, Bulgaria came and helped us, repaying the favor from earlier in the war. This has been a big year for the Central Alliance! We watched as the others in our alliance attacked Serbia and won! We cheered from afar and asked them how else we could help and what else we could/should attack. We watched them fight a big battle in Belgium. It was a close one, but they managed to pull it out. Then, on top of that Germany went into France and took their F1! Their capital! We also supported our alliance in their attack on Montenegro which was a success. And then it was our turn. Along with Bulgaria, we attacked Romania and took control of that country. It was a great way to make the Allied Powers sweat a little. This year the Central Powers attacked Italy. First we attacked their capital in order to try and take control, but the Allies succeeded in that attack and we lost. But, that didn’t deter us, we then attacked the lower part of Italy and took control. If the war had lasted longer, we may have been able to take control of all of it. The Allies took back Serbia and then we took it back again. We basically allowed the Allies to take back France. We didn’t think it was worth more bloodshed. Also, we were attacked and Great Britain took our capitol. It was a tough loss, but we had no notice of attack before it was too late. The good news is the war is over and the bloodshed is over for everyone. The Archduke was killed!!! Tensions have been rising and allies are being formed and war seems almost impossible to avoid. We feel threatened by the central powers. I plan with France, Great Britain, and Russia. If Austria Hungary and Germany Attack, I hope that Russia will defend me. I believe that my alliance with France and Great Britain will make Germany hesitate to leave in order to prevent an attack. There has been a lot of talk of war. There are rumors that Serbia was responsible for the killing of the Archduke. They denied that anything was their fault, however. We are allies with Serbia and hope that we do not get dragged into war. Tensions are rising and war is about to break out. We do not plan on getting involved in this war. We need to stay neutral until 1917. Austria and us do NOT get along. Our plan is to take them down. We publicly allied with France and Russia. We secretly allied with Great Britain and Romania. Our plan is to ally with Belgium and Bulgaria. We hope that they do, because they could hurt us deeply if they join the central powers. France is going to take over Germany and with all the countries allied they will have a huge army. (Second half of 1914) We don’t trust Bulgaria! We moved 150 troops into Bulgaria along with Russia and destroyed Bulgaria. We have a plan to take out Austria Hungary. We all do this by getting control of every region surrounding, then when the time is right we will all swoop in and declare war on Austria Hungary. With us staying neutral until 1917, not much happens. At this point we plan to join with the allied powers once we can split off. A lot of action today. We are hoping that if we stay quiet, we can keep ourselves out of this war. Germany just tried to take over us but they didn’t succeed. We need to get A3 and A2. Germany however DID take over part of Russia which is bad!! we need that back. Thank God for Montenegro and Romania for helping us out otherwise we would be gone. We had to help Serbia so we sent all our troops to Serbia so they wouldn’t be defeated. I don’t know what we will do now… luckily we are small anyways. Hopefully no one takes advantage of our troops absence. Still neutral and staying out of everyones way. If we weren’t neutral we probably would have sent some troops over to help Serbia because they were attacked today. Serbia didn’t have enough troops to hold everyone off. We have been attacked. We are counting on our allies to come help us out when they can. They are our last hope!! We still have zero troops in Montenegro. Praying for peace in our country. This is our last day to be neutral. Enjoying the relaxation while we can. Tomorrow we hope to see some action. Today we had hoped things would go a little differently. We were hoping that some of our allies could help us get Serbia back, but thats not what happened. Instead, our allies were VERY focused on getting back part of Russia and part of France. We attempted it twice and failed both times. Luckily, Germanys troops are thinning out so maybe we can comeback from all this tomorrow! Today was a bad day. Unfortunately because we had previously helped out Serbia by sending our troops over, we were attacked today and lost the battle. Central Powers has such a good rating… we can’t compete. If we have time, we plan to get Serbia back and possible Montenegro as well. Today we are no longer neutral. We allied with allied powers. We were hoping that no one would touch us today and thats what we got! We still have all of our troops and tomorrow we plan to use them to help out Serbia and our other allies. Greece saved us!!! We have Serbia back. I hope no one takes us again. Austria Hungary took us over again. There’s nothing we can do at this point. We are apart of Central Powers. Luckily our allies have been gaining territory. We hope Greece can save us today, but we know that their priority is more focused on Serbia. Serbia has been taken over again. We have no hope anymore. We are apart of Central Powers. We are fearing that Bulgaria may try to attack us and try and capture Macedonia. We hope this doesn’t happen. Bulgaria is attacking Greece. France is sending some troops to help along with their navy. We won!! We are in allied powers to end off the war. We as a country made several alliances, along with mobilizing our troops. With these new alliances, we as a country believe we can win this war. We will stop German and Austrian expansion to the east. We will begin our attack in the south and our first goal will be to take the Ottoman Empire. With our vast numbers of troops they will be no match for the Russian Army! We have made an attack on Bulgaria as we had reason to believe they were siding with the Central Powers. Serbia assisted us in the assault. It seems as we were correct as the Ottoman Empire came to aid Bulgaria in their defense. We were out numbered, and the battle was lost. We did manage to spread some of the Ottoman Empires troops. Making their southeastern borders more vulnerable. Our allies have begun to move troops to Belgium. We must hold Belgium from the Germans. The Ardennes forest will help France defend themselves from Germany. As long as allied troops are in Belgium France will be protected. Germany declared war against us. They have attacked and destroyed a part of our navy. They will pay for this treacherous act!! The Germans have made another attack against Mother Russia. They have taken our most western region. This will not go unanswered. We will attack the Germans and reclaim what is ours! We have moved 3,00,000 troops towards our Western boarders. We will retake and conquer the Germans! We have also moved our troops towards our southern borders. Making a move on the Ottoman Empire. They have increased their number of troops around our borders. This is seen as a threat and will not go without action. We will attack the Ottoman Empire. Taking them will allow more access to the sea. We need the Dardanelles Straight in order for our allies to provide us with supplies. Today we kept declaring war on Ottoman Empire and kept losing! We lost so many troops, Russia’s troops are not strong so they did not help much even though we moved 3,000 into R2 and R4. We had to do that because they won the ottoman empire and they could have got into Russia and took the whole thing. We received great losses. Our allies assisted us in the assault but we still fell short. Over 7,000,000 young men lost their lives in the attempt to take the Ottoman Empire and reclaim our land from Germany. It may be in our best interest to protect our land and stay away from combat for awhile. Enough Russian lives have been lost. It’s time for our allies to get involved and start putting an end to the central powers’s anarchy. The Central Powers made an attack on Italy. Reinforcements from France and Great Britain came in their time of need. Italy was held and the Allies were victorious! This was a big turning point for us and our allies in this war. Germany attacked Belgium later that year and we were defeated. Germany took control of Belgium and then attacked France. Even with a lot of reinforcements France was still defeated. The German Army was to strong. Troops from the United States and Great Britain were transported to another area of France to prepare for an attack. We build up troops in an effort to defend the land we still controlled. Austria-Hungry have attacked a part of Italy. Great Britain came to their aid bringing troops from their navy. We successfully defended Italy. Great Britain then made an attack on the Ottoman Empire. They were victorious as well! the Ottoman Empire was no match for Great Britain’s vast army. The Dardanelles straight was finally taken. Our allies can now bring us supplies through it. Our soldiers are better equipped now. The United States and Great Britain made one final push back towards Germany! We were victorious and took back the rest of France. Germany is in their downfall now. With the United States, Great Britain and France, the Allies could defeat all of Germany and Austria-Hungry. We could reclaim the Balkans and help our allies in Serbia. We just got a telegraph from Great Britain. It appears that Serbia assassinated Austria Hungary. Tensions are high because we anticipate that Austria Hungary is going to try to send troops over. We think they are going to go to war with us. Serbia denies any involvement in this. They think this was done by rebels. Our biggest fears came true. Austria Hungary did attack Serbia and sent troops in. It didn’t take Serbia long to fall because they just didn’t have the resources or military to put up much of a defense. Now that Serbia is under Nazi control, we anticipate other country’s becoming involved as well due to alliances. Thankfully we are an ocean away, and the war will be over once France and Great Britain join the defense. France and Italy are now involved in the war along the side of Great Britain. They are mounting an attack to push back the Ottoman Empire and their allies. Belgium and the eastern part of France must hold the line, otherwise we may need to send reinforcements not only of supplies but also in troops. If they fall, we will need to join the war effort to defeat the Central Powers. The future of freedom and democracy is in peril. We have joined the Allies in an effort to stop the Central Powers. They have attacked Belgium with 7000 troops and Belgium is now under their control. Romania and Russia have mounted a strong defense after Germany attacked on that front as well. After much discussion with our Allied partners, it was decided that France and Italy would mount a counter attack on Austria Hungary. We moved 500 of our troops into France, but our territories continue to be taken and our armies are dwindling. Germany continues to attack France and no matter how many troops we and our Allied partners send, we continue to lose ground. This update just came in – We have lost France. Lord help us……..
been able to recover Germany, but the Central Powers were victorious in holding their ground and we have lost the war. This isn’t over……..
We as a country made several alliances, along with mobilizing our troops. With these new alliances, we as a country believe we can win this war. We will stop German and Austrian expansion to the east. We will begin our attack in the south and our first goal will be to take the Ottoman Empire. With our vast numbers of troops they will be no match for the Russian Army!!!! We have made an attack on Bulgaria as we had reason to believe they were siding with the Central Powers. Serbia assisted us in the assault. It seems as we were correct as the Ottoman Empire came to aid Bulgaria in their defense. We were out numbered, and the battle was lost. We did manage to spread some of the Ottoman Empires troops. Making their southeastern borders more vulnerable. Our allies have begun to move troops to Belgium. We must hold Belgium from the Germans. The Ardennes forest will help France defend themselves from Germany. As long as allied troops are in Belgium France will be protected. Germany declared war against us. They have attacked and destroyed a part of our navy. They will pay for this treacherous act!!!! The Germans have made another attack against Mother Russia. They have taken our most western region. This will not go unanswered. We will attack the Germans and reclaim what is ours! We have moved 3,00,000 troops towards our Western boarders. We will retake and conquer the Germans! We have also moved our troops towards our southern borders. Making a move on the Ottoman Empire. They have increased their number of troops around our borders. This is seen as a threat and will not go without action. We will attack the Ottoman Empire. Taking them will allow more access to the sea. We need the Dardanelles Straight in order for our allies to provide us with supplies! We fell short in our assault against the Ottoman Empire. We received great losses. Our allies assisted us in the assault but we still fell short. Over 7,000,000 young men lost their lives in the attempt to take the Ottoman Empire and reclaim our land from Germany. It may be in our best interest to protect our land and stay away from combat for awhile. Enough Russian lives have been lost. It’s time for our allies to get involved and start putting an end to the central powers’s anarchy. This year we decided to not mobilize. The reason that we chose this is because we wanted to not have to fight for either side or be put in a situation were we needed to. Both sides at this point are trying to recruit us to there side and so we can ensure that they will not be attacking us and we are protected and so we strategically don’t need to or have to mobilize a this point in time. This year we had to remain neutral. It was clear that both sides wanted to be in an alliance with us still. We decided to portray that we were just completely neutral so that we wouldn’t be attacked. We did know that we needed to make a secret alliance with France and the allies when 1915 rolled around, but we didn’t want to stir the dust until we had to. We did strategically talk to France though to make sure that they were willing to do that with us. This year we decided that it was in our best interest to strategically make alliances with all of the all of the allies countries including the alliance that we needed with France. Great Britans country of Egypt got attacked and so we decided to let Great Britain take some of our troops on there amazing navy to help defend that. Doing a favor for Great Britain is strategic and can help us in the future if we get attacked also. It was also to show the other allies forces a definite action that Italy was on there side for sure. Today we got attacked by Austria Hungry. They sent 5000 troops at us. France came to our rescue thank goodness and we also strategically decided to pull out of Egypt to defend the homeland and then to also move troops from f2 to f1 to also defend. Allies were victorious but we were weakened. We are planning to see how we can capture A1 and A2 for our objectives. We think that if we just wait a little bit longer the other people fighting with us will help knock the enemies troops making it easier. Russia is attacking and because we all have to work together with the alliance, we decided to send the 118/ of our 128 to help them. this is smart so then France said that they would send some of there troops down to help us and then we will have more troops to be able to get the A1 and A2 that we need. I am very nervous only being left with 10 troops there, but France has agreed to move 282 troops there now incase we get attacked. Today Italy was in a time of no action. We were severely injured by previous attacks and failed attempts at helping other countries get land. Our troop numbers were nearly nonexistent and during this time we only had French troops to protect our country. Our plan is to wait it out until we get more troops the next day and then try to get our objectives then. Today I attempted to get my objective by sending my remaining 810 troops from I1 to I2 to try to take the land and reach my objective of getting Trieste in Austria Hungary. Even though it was a good effort, the central powers were able to still keep it because of there alliances helping them, I then took my navy to help take back Serbia for the Allies and that attempt was victorious. We also then helped defend Greece. The central powers decided to attack my I1 to take my capital but we got reinforcements from Great Britain and France to be able to keep it. They did sadly take over I2 though.